As autumn is drawing to its end, I find myself very grateful for having ventured outside just in time to collect a few of these stunningly coloured fall leaves. 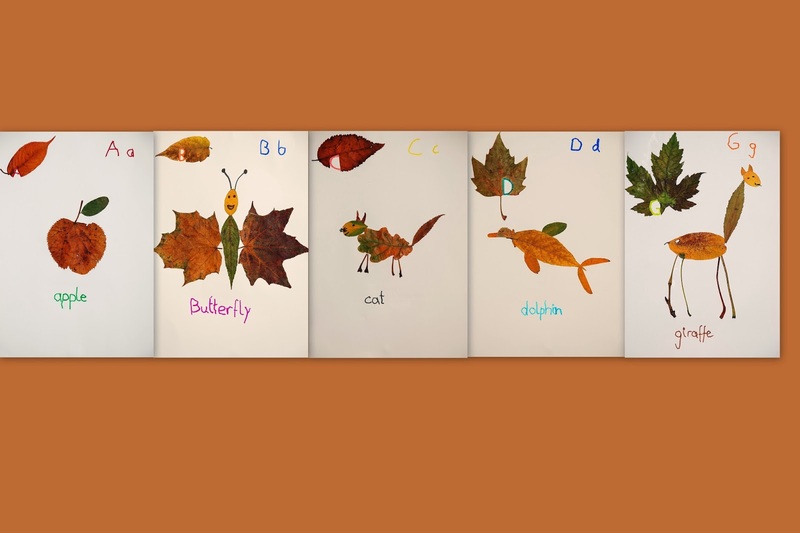 Now, today we finally started with THE project - converting our pile of neatly pressed (+ and finally dried) leaves into our own illustrated alphabet. Drum roll, please, here they come! What do you think? Personally, I think we did a pretty good job - and, no, I'm not in any way unfamiliar with the order of the letters in the alphabet - the reason for our lovely giraffe to appear directly behind the dainty dolphin is even more embarrassing actually: Somehow, the Picture of a Giraffe came up when I googled 'animals with d' (so I'll blame it all on Google now), and this was actually the first poster we created for 'd'. Before I realised my mistake of course and quickly erased all evidence of crime. So shhh. This is an amazing project if you (like me) have some smaller children at home that are yearning for any kind of entertainment but left on their own would spent their day in front of the TV. I especially liked the way this particular idea managed to let nature slip in as well - I'll definitely be on the lookout for more nature DIY-projects! What did you do with your collected stash of autumn colours? I just love this season, as it slowly gets colder and colder you finally have an excuse for curling up on the sofa, wrapped up in blankets and sipping on your tea whilst reading a book. And the air outside is just so crisp and fresh and... autumnal!